In the seventh episode of Madang Live, a television programme covering the 10th Assembly of the World Council of Churches in Busan Republic of Korea, we bring you the latest on choosing members of the General Assembly of the WCC. We look at the role of disabled people at the Assembly, we show a feature on the EAPPI programme in Colombia and interview two Orthodox Church Leaders. In Episode 6 of Madang Live, a news programme of the WCC 10th Assembly in Busan Republic of Korea, we bring you the latest news on the Assembly. In this episode we cover the Justice Plenary Session, we look at the elections for a new Central Committee, we bring a feature about Smoky Mountain in Manila and an insert on inter-religious dialogue. 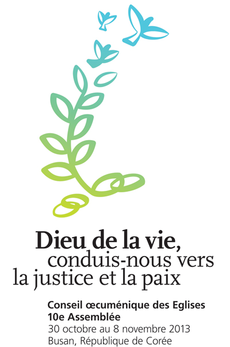 God of life, lead us to justice and peace - The theme of the World Council of Churches 10th Assembly is not merely a slogan for the event, but provides a focus for theological reflection, worship and meditation. In this video, young Christians from different parts of the world explain what the theme means to them. God of life, lead us to justice and peace - In this video, Christians from various member churches of the World Council of Churches reflect on the importance of the WCC 10th Assembly theme in the context of today's world. God of life, lead us to justice and peace: "This theme is not merely a statement, but it is a call to action" says the Rev. Diana Anne Tana of the Methodist Church of Aotearoa New Zealand. In this video, she and other Christians from various WCC member churches in Asia and the Pacific region reflect on the meaning of the assembly theme for the churches.